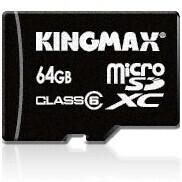 If your smartphone's storage capacity is never enough for your needs, KINGMAX has you covered. The Taiwanese manufacturer has just introduced the world's first 64GB microSD card, which should be plenty of storage for even the biggest digital hoarders out there. Just think about it – teaming your smartphone with a 64GB microSD card means that you can carry around a ton of photos, songs, and videos without worrying much about running out of space. KINGMAX's 64GB microSD card should be able to hold about 30,000 digital photos in their original resolution, over 2,000 audio albums, or more than 24 hours of 720p HD video. Besides that, the module is rated as Class 6, which means that the microSD card should be able to read and write data at speeds of over 48Mbits per second. KINGMAX has also implemented error correction control, promises low energy consumption, and tops everything with a lifetime guarantee. So how do you get one? It is too early to say – pricing and availability are still to be announced, and other manufacturers might come up with 64GB microSD cards of their own. There are still too few devices that support microSD cards of that size anyway, so we wouldn't expect to see 64GB ones earlier than the end of this year. I know rite? No doubt this is gonna touch the 200 mark so this won't even be an option for me for about another year. This is awesome and everything, but what devices on the market can use it, other than computers? Most cell phones are limited to 32GB expandable memory (to my knowledge), unless the OEM just states 32GB because it's the largest available at the time of manufacture. This is great news for all the top smartphones coming soon,64gb is huge but also its cheaper to gain this memory in a micro sd card form than internal memory,for instance theres generally around 100 euro of a difference between the 16gb iphone 4 and the 32gb iphone 4 despite people being easily able to pick up a 16gb micro sd card for 30 odd euro,or maybe perhaps this price difference is entirely down to apples greedy overpricing policies. Still its good to see smartphones able to booth up these memory cards in the near future! I remember reading that 32GB was the "theoretical maximum" for microSD format. So much for that! Sure do wish I could find the article, though. Technically correct and incorrect at the same time. Companies advertise storage in binary. You're thinking of decimal. It is 32GB in binary storage though. The fastest and easiest way for me to compute binary storage is with xGB(.93)=Storage. A lot of SSDs nowadays are being advertised in decimal storage. ie. MacBooks are advertised in decimal for their storage. This is often where you hear Apple users talk about how they're getting the real advertised storage. Lexar has 128 GB. See it on Wikipedia. Hopefully phones in the near future will be able to support these. I rather see faster speeds than size- for example I'd like to see Class 10, 5,10,15,20...32GB size cards.